Melbourne contributor Kate and her little gumnut cuties Arlo and Macy attended the preview event of the upcoming theatre production of May Gibbs' beautiful story of Snugglepot & Cuddlepie which will be playing at the Arts Centre Melbourne these Spring school holidays from Saturday 17th to Sunday 25th of September 2016, 55 mins, ages 5+ and an AUSLAN interpreted performance available. Looks like they had a great time listening to the beautiful story, watching a preview video of the production, patting some Australian native animals and doing some arts & crafts. And tucking into some gorgeous themed cupcakes and lunch boxes! For more info on the production, head to the Arts Centre's dedicated page. Thank you Kate for the great preview review and gorgeous pics! This year is the 100th anniversary of May Gibb’s first book Gumnut Babies, published in 1916, which started her series of imaginative bush fairy tales. But it was the heroic adventures of two little gumnut foster brothers, Snugglepot and Cuddlepie which became the stories that she is best remembered for. 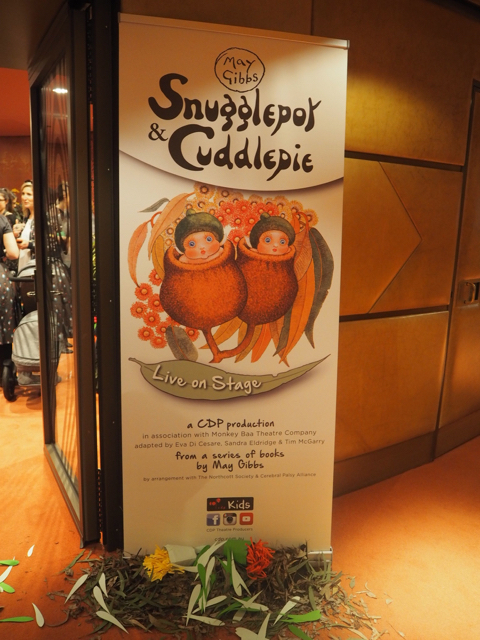 Now, a new theatre production aims to put Snugglepot and Cuddlepie back where they truly belong: in the hearts and imaginations of Australian children. 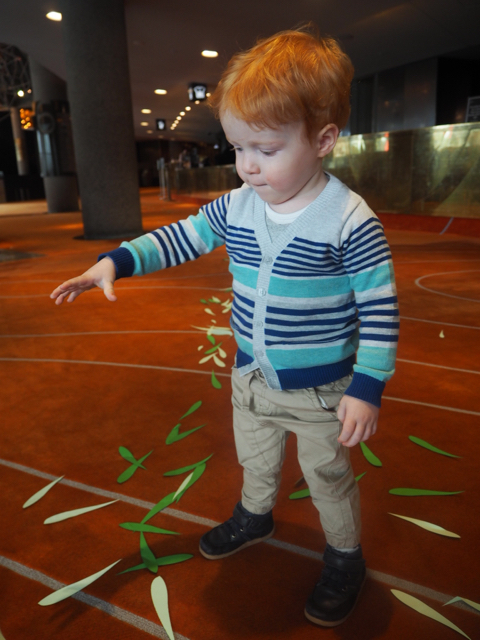 The doors opened into the St Kilda Road Foyer at Hamer Hall and with much excitement we followed the green paper leaf trail down to the Melbourne Room. We entered the intimate room styled superbly by Pilar Props with eucalyptus leaves, fresh wattle and gumnuts (the decadent Florence Broadhurst wall covering made for a perfect backdrop). The poppets joined the other little guests at the craft table and began to draw on the adorable Snugglepot and Cuddlepie colouring sheets. We were then introduced to the host of the morning, Sweet Wattle Flower who really sparkled in a bright green sequinned top, sheer yellow skirt, beautiful floral crown and wrist corsages (made from native Australian flowers) and rosy red cheeks. 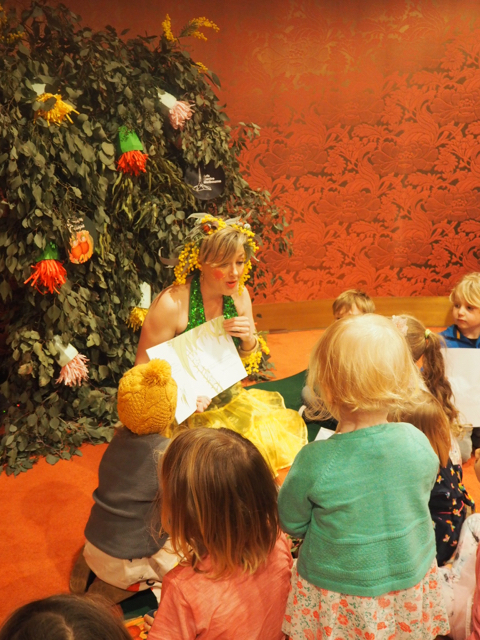 Sweet Wattle Flower invited all the children down to the floor for a very special storytime. However, this was no ordinary storytime! After sitting quietly and attentively throughout the reading (which had me totally reliving a childhood favourite), watching a short video about the upcoming theatre production and a singing along to a few verses of The Kookaburra Song, Sweet Wattle Flower announced that she had some special little friends to introduce to us. Cue the squeals of excitement from the children! Michael from The Zookeepers then appeared with a beautiful kookaburra and one after another we came face to face with a lizard, a possum who likes to curl up inside a woollen beanie, a snake, a green frog who was clearly in a jumpy mood (cue the sequels of fright from the parents!) and the cutest eight week old dingo puppy, named Winter. 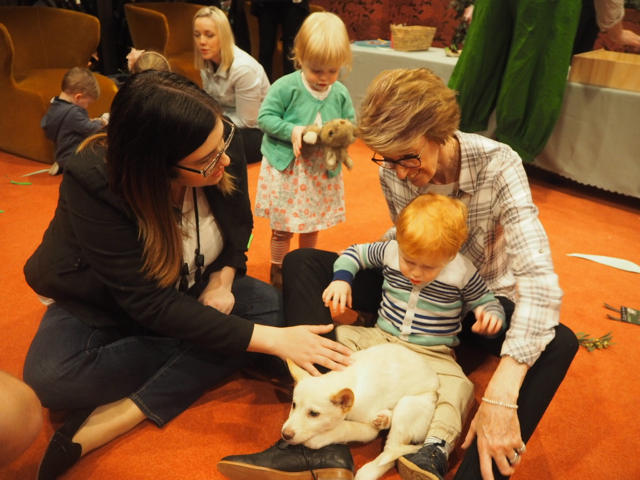 Everyone was given the opportunity to pat the animals and it came as no surprise that Macy wanted to hold each and everyone of them, including the snake – who was longer than she was! Arlo on the other hand was a little bit reserved, preferring to stand behind me and watch from afar but he did enjoy having cuddles with Winter, who enjoyed chewing on his Bobux boots! Once we waved bye-bye to all the animals (and cleaned our hands with provided disinfectant wipes, good planning!) all the children were spoilt with a scrumptious lunchbox plus exquisitely decorated and absolutely delicious cupcakes from One by One Cakes. I mean just look at the detail in that little gumnut baby figurine – way too pretty to eat. We finished off the morning with a sweet craft activity guided by Sweet Wattle Flowermaking our own little gumnut babies. Too cute! With a piece of wattle behind their ears and holding onto their gumnut babies, I found myself smiling as we headed for home. I was so happy to have introduced the poppets to the much-loved characters of Snugglepot and Cuddlepie and certainly cannot wait to see them come to life on stage at Arts Centre Melbourne. 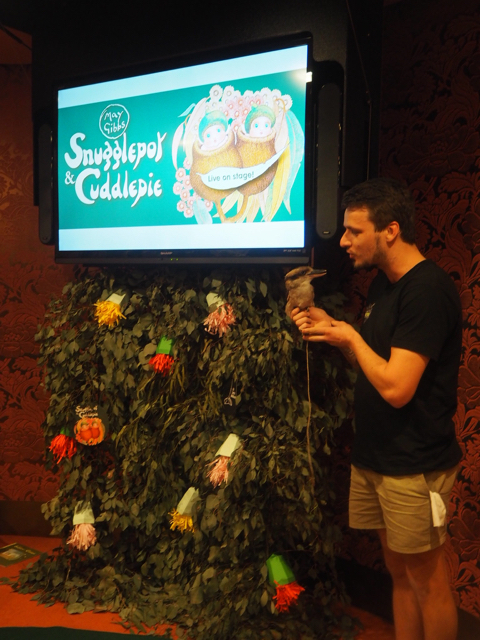 Parents will be able to buy the Snugglepot & Cuddle Pie lunchbox (vegetarian & gluten free options available) and kids can enjoy pre-show entertainment Stories in the Wall: Bush tales. A collaborative digital storytelling project between Arts Centre Melbourne and Victorian Primary and Secondary Schools, culminating in an audio installation in the Smorgon Family Plaza. Bush Tales partners the best of Victoria’s secondary school composers and sound designers, with original plays written and acted by 68 Victorian Primary Students. For more ideas, on what to do in Melbourne with the kids, head to our Daily Spots page or checkout other reviews on the blog.